We perform a systematic analysis of moduli stabilisation for weakly coupled heterotic string theory compactified on internal manifolds which are smooth Calabi-Yau three-folds up to α′ effects. We first review how to stabilise all the geometric and gauge bundle moduli in a supersymmetric way by including fractional fluxes, the requirement of a holomorphic gauge bundle, D-terms, higher order perturbative contributions to the superpotential as well as non-perturbative and threshold effects. We then show that the inclusion of α′ corrections to the Kähler potential leads to new stable Minkowski (or de Sitter) vacua where the complex structure moduli and the dilaton are fixed supersymmetrically at leading order, while the stabilisation of the Kähler moduli at a lower scale leads to spontaneous breaking supersymmetry. The minimum lies at moderately large volumes of all the geometric moduli, at perturbative values of the string coupling and at the right phenomenological value of the GUT gauge coupling. We also provide a dynamical derivation of anisotropic compactifications with stabilised moduli which allow for perturbative gauge coupling unification around 1016 GeV. The value of the gravitino mass can be anywhere between the GUT and the TeV scale depending on the stabilisation of the complex structure moduli. In general, these are fixed by turning on background fluxes, leading to a gravitino mass around the GUT scale since the heterotic three-form flux does not contain enough freedom to tune the superpotential to small values. Moreover accommodating the observed value of the cosmological constant is a challenge. 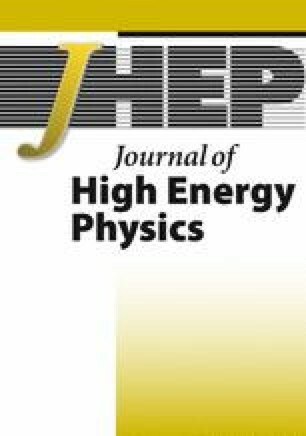 Low-energy supersymmetry could instead be obtained by focusing on particular Calabi-Yau constructions where the gauge bundle is holomorphic only at a point-like sub-locus of complex structure moduli space, or situations with a small number of complex structure moduli (like orbifold models), since in these cases one may fix all the moduli without turning on any quantised background flux. However obtaining the right value of the cosmological constant is even more of a challenge in these cases. Another option would be to focus on compactifications on non-complex manifolds, since these allow for new geometric fluxes which could be used to tune the superpotential as well as the cosmological constant, even if the moduli space of these manifolds is presently only poorly understood. R. Donagi and M. Wijnholt, Higgs Bundles and UV Completion in F-theory, arXiv:0904.1218 [INSPIRE]. P. Candelas, X. de la Ossa and F. Rodriguez-Villegas, Calabi-Yau manifolds over finite fields. 1., hep-th/0012233 [INSPIRE]. 4.UCB 390 Physics Dept.University of ColoradoBoulderU.S.A.